News of Mark Twain’s demise prompted his famous though slightly misquoted quip: “Reports of my death are greatly exaggerated.” While he may be the celebrity most often cited on the topic of glimpsing one’s own obituary, Twain is certainly not the only historical figure to predecease himself. If asked, I have no doubt that Lynch’s Ferry readers could quickly compile dozens of examples of Twain-like incidents that triggered a premature outpouring of public grief (or sparked a collective celebration, depending on the reputation of the departed). On the flip side, I’m also certain that Lynch’s Ferry readers could name quite a few superstars who have been spotted gallivanting around the globe many years after their real funerals. However—here comes the big brain teaser—when comparing the list of mistaken obituaries with the list of dead-celebrity sightings, how many famous people do you think would appear on both? I can think of one. But that’s because I have already read this issue. History is a humbling thing. In his debut article “‘The Sweeney’s are indeed a wonder! 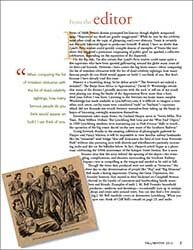 !’: The Banjo from Africa to Appomattox,” David D. Wooldridge reveals that many of the themes I proudly associate with the rock ’n’ roll era of my youth were playing out along the banks of the Appomattox River more than a hundred years before I was born. Listening to the Sweeney-era banjo music samples Wooldridge has made available at LynchsFerry.com, it is difficult to imagine a time when such sweet, catchy tunes were considered “rude” or “barbaric”—opinions which did not dissuade star-struck Sweeney wannabes from taking up the banjo in hopes of becoming overnight sensations themselves. Going forward, thanks to the amazing collection of photographs gathered by Harper and Nancy Marion, it will be impossible to view familiar railway landmarks like the “immense” steel bridge “that still dominates the field of view from Riverside Park” without also picturing men with shovels and wheelbarrows patiently excavating rocks and dirt on the hillsides below. In fact, Harper’s article began as a photo essay celebrating the 100th anniversary of the Kemper Street Station. But it soon became clear that the story behind the opening of the depot—the wrangling, complications, and disasters surrounding the Southern Railway bypass—was as compelling as the images and needed to be told in full. Though the items they produced were not nearly as “immense,” the sheer day-to-day determination of people like “Pop” and “Big Momma” Bell made a lasting impression. During the Great Depression, the foundry business they started in their backyard on Campbell Avenue thrived on the loyalty of customers and hardworking family members and friends. Examples of early J. M. Bell Foundry household products—andirons and doorstops—occasionally turn up in antique shops and estate sales around town. You can also find a few remaining J. M. Bell manhole covers in downtown Lynchburg. When you spot one, think of Cliff Bell’s remark on page 23, and smile.